As the world continues to pump greenhouse gases into the atmosphere, the global temperatures could rise by 3°C by mid-century, says a soon-to-be-released report of the Intergovernmental Panel on Climate Change. Extreme weather events will become even more intense. Erratic monsoons and severe cyclones have already battered large parts of India this century. It is a definite recipe for disaster, barely short of apocalypse. Thousands may die, millions get affected, and assets worth billions of dollars get destroyed. As human-induced greenhouse gases increase, so will extreme weather events like floods, heat waves and droughts. The latest report of the Intergovernmental Panel on Climate Change (IPCC) presents this grim picture. Surely then, the Special Report on Managing the Risks of Extreme Events and Disasters to Advance Climate Change Adaptation, which will be released in Uganda on November 18, is no harbinger of good news. The report, culled from scientific studies undertaken across the world, makes a strong link between extreme weather events and greenhouse gas concentrations from anthropogenic emissions. This, it says with two-thirds surety, would decrease the number of cold nights in a year and make days warmer. Since the 20th century heat waves, like the one in Asia in 2007, have increased. Droughts have intensified since 1950 and are prolonged, especially in western Africa and southern Europe. The report also names greenhouse gases as the probable culprit for increase in the mean sea level and tidal intrusions. Over the years, nations have suffered huge losses because of extreme weather events. The estimate for annual global monetary loss from such events between 1980 and 2010 ranged between a few billion US dollars and 225 billion US dollars. The year 2005 was worst hit, as Hurricane Katrina swept New Orleans in the US. However, monetary loss in developing nations is difficult to ascertain, the report clarifies. Cultural heritage, ecosystem services, informal and undocumented economy cannot be monetised. Between 1979 and 2004, 95 per cent of all deaths from natural disasters occurred in developing nations. If the loss is valued in terms of gross domestic product (GDP), between 2001 and 2006 low income countries lost about 0.3 per cent due to these freak events. Developed nations lost only about 0.1 per cent of their GDP. But the worst hit were countries with rapidly expanding asset base, like India and China, which lost about one per cent of their GDP. Asia seems to have borne the maximum brunt of intensified weather events between 2000 and 2008, the report notes. By the middle of this century, annual daily temperatures could gradually increase by 3°C, peaking at 5°C towards the century’s end. The frequency of cyclones may remain the same, the report says, but their intensity and maximum wind speeds are likely to increase. This will increase the number of people who get affected by it. In 1970s, the number of people exposed to tropical cyclones was about 73 million. With increased intensity, the number may double by 2030. East Asia, including China, Japan, the Koreas and Russia, is most vulnerable, accounting for more than 90 per cent of the hits (see map). The same holds true for floods. The IPCC sounds a red alert on inundations due to high rainfall events like the one in Mumbai in 2005. The Maximum City received half of the season’s rainfall within a day (see ‘Megacities in danger’). Such events occur once every 20 years. By the end of the century, these may become as frequent as once every five years. 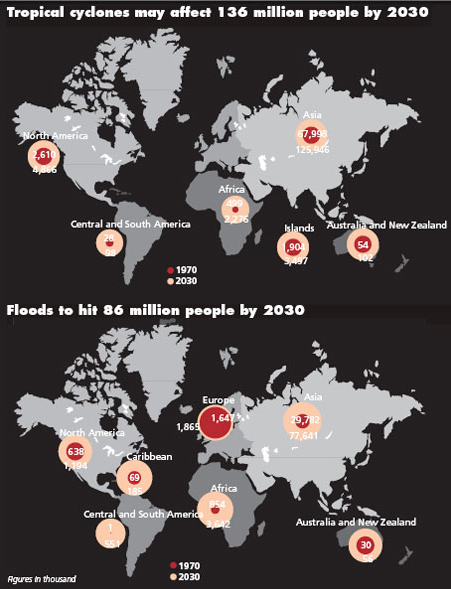 About 86 million people are likely to get exposed to floods by 2030, about two-and-a-half times more than in 1970s. The report issues yet another warning. This is for people living in mountainous regions. Heat waves, glacial retreats and permafrost degradation may lead to hazards like glacial lake outburst floods and landslides. 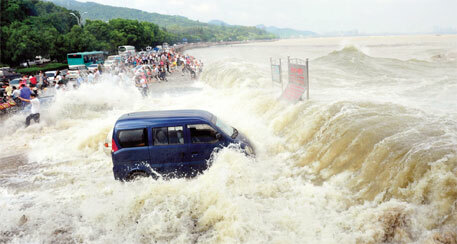 The 2005 floods in Mumbai were unprecedented. Within 24 hours the city received 94 cm of rainfall. About 1,000 people, most living in slums, died. Business was severely hit with communication, electricity and transportation completely paralysed for days. This forced IPCC to name Mumbai as the city with the highest population exposed to coastal flooding. At present, about 2.8 million people and about US $46 billion worth assets are exposed to coastal flooding. By 2070, the exposed population will increase to 11 million people and exposed assets to about US $1.6 trillion. Mumbai epitomises the dangers megacities on coasts face. In this case, adaptation is difficult because most of the infrastructure development has taken place in the past 150 years, and not planned to tackle climate change induced weather changes. This makes slum-dwellers extremely vulnerable as even a 50 cm rise in sea level could wipe out settlements. Other cities that the IPCC report names are Kolkata, Dhaka, Guangzhou, Ho Chi Minh City, Shanghai, Bangkok, Rangoon, Hai Phong and Miami. All except Miami are in developing countries. About 1.3 to 1.4 billion urban poor lay exposed to sea level rise and they are overwhelmingly in developing countries. 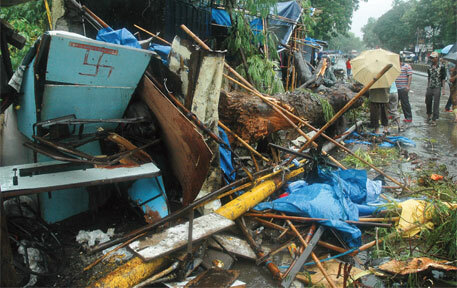 Close to 350 people died in 2009 as Aila, the devastating cyclone, swept West Bengal and Bangladesh. In 2010, yet another cyclone, Laila, caused widespread destruction in Andhra Pradesh, killing 15 people. Scientists say such extreme weather events are a direct consequence of climate change. In a global warming scenario, these events will increase, warned climate experts at the national research conference on climate change organised early this month by the Centre for Science and Environment at the Indian Institute of Technology, Delhi. “The frequency of tropical cyclones in the northern Indian Ocean may not have increased significantly, but their intensity has,” says M Rajeevan, monsoon expert and senior scientist at the National Atmospheric Research Laboratory in Tirupati. If extreme weather events is one aspect of climate change, rise in diseases is another. “As the globe gets warmer, many diseases are set to become a greater threat to human health, said Ramesh C Dhiman during the national conference on climate science organised by the Centre for Science and Environment in collaboration with the Indian Institute of Technology. Dhiman is a scientist at the National Institute of Malaria Research. Vector-borne diseases, spread by mosquitoes, ticks and flies, will rise because the carriers are cold-blooded and need warmth to breed. 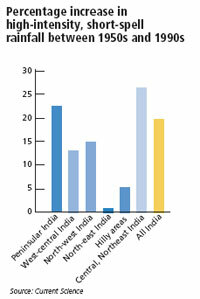 Malaria is likely to reach even the Himalaya, while also hitting the Northeast hard. Twenty-one districts in the Northeast will have a longer malarial risk period—from about nine months now, to about 12 months in 2030. Assam will be the worst hit as its 13 districts will have a round-the-year malarial threat. In other parts of the country, mainly south and south-east, where the weather will get too hot even for mosquitoes, the insects are adapting by hiding in forests, inside air-conditioned houses and in water tanks during warm days. Diseases like chikungunya and kala-azar have started re-emerging since mid-2000s. As cities get hotter, certain non-vector borne diseases may also become prevalent, says Dhiman. Heat and sunlight intermingling with pollution may increase the burden of asthma. Between 1951 and 2000, India has witnessed short spells of heavy-intensity rainfall—lasting less than four days—during monsoons. This trend analysis of S K Dash, professor and head at the Centre for Atmospheric Sciences, IIT Delhi, also shows that long spells of low- and moderate-intensity rainfall—four or more days—have become fewer and far between. This does not bode well, says Dash. “Lots of rainfall in short spells means wastage of water. Most of it gets drained. While big cities suffer waterlogging, it is also bad for agriculture. Many crops need a regular and steady supply of water,” he says. Scientists agree that the Indian monsoon is weakening, primarily due to climate change. “Monsoon rainfall in India is caused by synoptic events like depressions and cyclonic storms. But the frequency of these events is decreasing and local systems are substituting them,” says Dash. For example, localised clouds formed due to intensive evaporation can cause rain. Could the change be due to monsoon’s inherent variability? Had it been so, the change would have showed up 50 years ago in trend analysis. But it did not, says Dash. In fact, no one can categorically specify the reason for the changes in precipitation, says Rajeevan. “We can only speculate. But global warming looks to be the most likely factor. The increasing trend is significant enough to suggest that an external factor is at play,” he adds. Over the years, India has also witnessed heavy precipitation—rainfall and snowfall—over hilly areas. India Meteorological Department (IMD) data shows the increase between 1962 and 2010. Even though overall frequency of rather heavy precipitation (more than 24.4 mm) over north-western Himalayas was not significant, scientists noticed 10 per cent increase over the Srinagar area in Jammu and Kashmir. The activity was prominent during monsoons and winters. 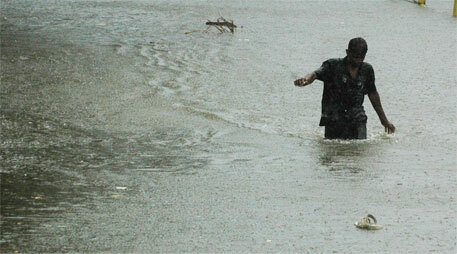 An analysis by IMD scientists warns of increased flood risk over most parts of India. “Increasing flood risk is now recognised as the most important sectoral threat from climate change,” they wrote in Current Science in June this year. The scientists collected rainfall data from 2,599 stations in the country between 1901 and 2005. The study showed considerable spatial variability in heavy rainfall trends over the country. It concluded that the frequency of heavy rainfall events is increasing substantially in peninsular, east and north-east India. Ghosh’s latest study, which is being considered for publication in a leading international journal, reveals that there is increased spatial variability in the incidence of extreme rainfall events over the country. Krishna Kumar of Indian Institute of Tropical Meteorology, Pune, used a regional climatic model (Providing Regional Climates for Impact Studies) for future climate projects in India. His simulations for 2020s, 2050s and 2080s, which appeared in Current Science in August this year, indicate an all-round warming over the Indian subcontinent with increasing gas concentrations. His simulations for the future also suggest a high degree of variability in precipitation events across the country. Droughts attract wide media coverage. But it has not been studied thoroughly by the IMD. “There are not enough long-term studies that have analysed its trends,” says Rajeevan. One of the few IMD analyses says there were 22 deficient monsoon years between 1901 and 2003. There were 28 years when more than 21 per cent of the country’s area was under drought, with four—1911, 1918, 1972 and 1987—being severe drought years. The severe drought of 2009 was not part of the analysis. Sivanand Pai, senior scientist at IMD and one of the authors of the analysis, says there have been no significant trends as far as droughts are concerned. Some states show negative trends and some positive, possibly due to monsoon’s inherent variability. However, Dash’s analysis shows prolonged dry spells have increased significantly over the past few decades. At the climate change conference, A S Unnikrishnan, senior scientist at National Institute of Oceanography in Goa, drew attention to a lesser known threat—extreme sea-level events, which occur mainly as storm surges resulting in more-than-normal rise in water level along the shores. Storm surges are generally driven by cyclones. “They are a greater threat to life and property,” he says. Research suggests that mean sea level rise due to rising temperature is a key contributor to extreme sea-level events. Unnikrishnan’s analysis has shown a rising trend of extreme-sea level events over Bay of Bengal. Heat is taking its toll on India’s workforce, research indicates. As part of its preliminary work on the relationship between heat stress and productivity, scientists at the Indian Institute of Technology-Delhi have attempted to look into the relationship between working hours and rise in temperature. Heat stress, which is caused when the body becomes overheated, reduces work capacity, as employees take frequent breaks to recover from exhaustion. S K Dash, professor at the Centre for Atmospheric Sciences, IIT-Delhi and his colleague T Kjellstrom from the National Centre for Epidemiology and Population Health, Australian National University, Canberra, looked at historical data on the number of workable hours during June, the hottest month in Delhi. He found that the number of workable days had steadily reduced between 1960 and 2000. 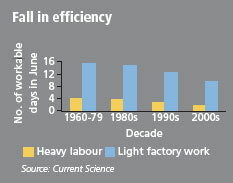 For example, between 1960 and 1979, an individual involved in serious labour, like construction work, would have worked only four days in June without taking a break due to exhaustion. Today, that number is reduced by half. At present, the Wet Bulb Globe Temperature (WBGT) is the internationally accepted standard for occupational heat stress and is used to quantify the need for rest breaks in different work situations, with the aim of keeping the core body temperature below 38ºC. The number of workable days in Dash's study was calculated using WBGT. However, this is not a suitable for India because of its complex climate. Dash wants to create a comprehensive formula specifically for India to calculate heat stress. This will help quantify the impact of heat on employees across several sectors. One swallow does not make a summer. Yes, indeed. But more extreme weather events, happening with increased intensity and frequency, do make for links with climate change. This much seems clear. But questions remain. How does the world measure “increased” frequency of extreme weather? After all, weather is always variable. Meteorological departments across the world keep records of changing weather events and patterns. Their records can point at similar events in the past when there was a similar cloudburst or frost or cyclone or freak snow. How does all this add up to climate change, especially when the world is only beginning to see these impacts? Data does not exist from the past to prove the trend that needs to be proved. Then there is the next set of questions? Even if weather is changing or extreme events are beginning to be seen and recorded, how do we know this relates to climate change, a phenomenon caused by anthropocentric emissions? All this is further complicated by the fact that devastation caused by extreme events, like droughts or floods, is more often than not complicated and involves mismanagement of resources and bad planning. In all this, the world is in danger of either not making the connection between extreme events, or making the connection to the point of over-simplification, which then attracts the derision of climate sceptics and scientists. So Al Gore, former US vice-president and climate change advocate, recently told a conference in the UK that “climate change is directly responsible for the extreme and devastating floods or the storms and droughts that displaced millions of people in the world”. Gore cited 2010 floods in Pakistan as one such evidence and said the link between rise in carbon emissions and intense and extreme events was real. Allen, importantly, is the guru of the “attribution” theory. His research has helped the world see the difference between externally driven changes in climate (or human-induced climate change) and specific weather events, the difference, as he puts it, “between weather and climate change”. 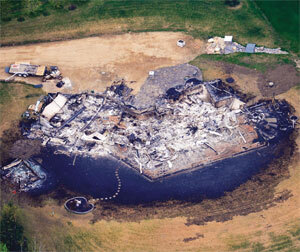 In 2000, Allen’s home was flooded when water inundated many parts of England and Wales. In 2011, he published a report which quantified the role of human-induced climate change and concluded that it had doubled the likelihood of floods in the UK. But the same scientist, who warns us about the link between climate change and extreme events, is of the view that Gore is wrong. Why? Writing in the British daily, The Guardian, Allen explains: “Gore is right that it is possible, in principle, to quantify the role of human influence on climate in specific weather events. And even that this has to involve probability: how much has human influence loaded the weather dice to make a particular event more likely?” But the fact that a method exists for establishing whether this is true does not mean anything until there are more studies that can effectively pinpoint the case in each instance. This is certainly true in the case of floods in many parts of the world. It is clear that there is increased evidence of extreme rainfall. But how much evidence exists to show that the damage caused by the devastating flood was because of this changed rainfall pattern (if it has changed) or because of bad drainage of the flood plains itself? In India, the 2009 floods in Bihar or the 2011 floods in Odisha can be linked to increased rainfall. But the scale of devastation is certainly because of the sheer folly of management by planners. In Pakistan, data shows the country received 200 to 700 per cent more rainfall than average; rain came in intense cloudbursts in ecologically fragile mountainous areas which led to natural dam bursts and floods downstream; rain came incessantly, leading to pulses of floods and greater devastation. But even as Pakistan, like India, has much to correct—from learning not to build habitations in flood-vulnerable areas to learning how to channelise water and not tame rivers within embankments that invariably burst or just do not work—it faces the prospect of not being able to cope when floods become a deluge. The devastation is complete. The fact is that even as the world argues, extreme events in global weather are increasing. The ultimate tragedy is that it is the poor who suffer the most. Those who have not contributed to the problem are the biggest losers. Climate Panel (IPCC) Charts Extreme Weather in a Warming World: Now the truth has come out in open that is some climate experts for the past more than a decade have intentionally exaggerated future risks and intentionally pushed very extreme doomsday views by relating extreme weather to global warming. The language was toned down in this report and they are cautious in putting the statements. This is exactly what I was advocating for the past few decades; however IPCC & Al Gore-trained PR groups relentlessly talking and pushing hard at government level other way. Let us see some of those reported view points: The IPCC won the Nobel Peace Prize with Al Gore in 2007 for its efforts on climate change, but later became a focus of controversy related to factual errors, with disastrous repercussions on the economy of national government. The findings were released at a conference in Kampala, Uganda, by the Inter-government Panel on Climate Change [IPCC], a high-profile United Nations body assigned to review and report periodically on developments in climate research. They come at a time of unusual weather disasters around the globe, from catastrophic flooding in Asia and Australia to blizzards, floods, heat waves, droughts, wildfires and windstorms in the United States that have cost billions of dollars. It appears that IPCC has tightened its procedures in the hope of preventing future errors in terms of language it used. The new report on extreme weather, one of a string of reports that the panel is issuing on relatively narrow issues, did not break much ground scientifically, essentially refining findings that have been emerging in climate science papers in recent years. Indeed, the delegates of IPCC meeting in Kampala, Uganda adopted scientifically cautious positions in some areas. For instance, some researchers have presented evidence suggesting that hurricanes are growing more intense because of climate change, but the report sided with a group of experts who say that such a claim is premature. Nonetheless, the report predicted that certain types of weather extremes will grow more numerous and more intense as human-induced global warming worsens in coming decades. “It is virtually certain that increases in the frequency and magnitude of warm daily temperature extremes and decreases in cold extremes will occur in the 21st century on the global scale,” the report said. “It is likely that the frequency of heavy precipitation or the proportion of total rainfall from heavy falls will increase in the 21st century over many areas of the globe.” By the end of the century, if greenhouse emissions continue unabated, the type of heat wave that now occurs once every 20 years will be occurring every couple of years across large areas of the planet, the report predicted. It is likely that the frequency of heavy precipitation will increase in the 21st century over many regions. It is virtually certain that increases in the frequency of warm daily temperature extremes and decreases in cold extremes will occur throughout the 21st century on a global scale. It is very likely--90 per cent to 100 per cent probability—that heat waves will increase in length, frequency and/or intensity over most land areas. It is likely that the average maximum wind speed of tropical cyclones (also known as typhoons or hurricanes) will increase throughout the coming century, although possibly not in every ocean basin. However it is also likely—in other words there is a 66 per cent to 100 per cent probability — that overall there will be either a decrease or essentially no change in the number of tropical cyclones. There is evidence, providing a basis for medium confidence, that droughts will intensify over the coming century in southern Europe and the Mediterranean region, central Europe, central North America, Central America and Mexico, northeast Brazil, and southern Africa. Confidence is limited because of definitional issues regarding how to classify and measure a drought, a lack of observational data and the inability of models to include all the factors that influence droughts. It is very likely that average sea level rise will contribute to upward trends in extreme sea levels in extreme coastal high water levels. 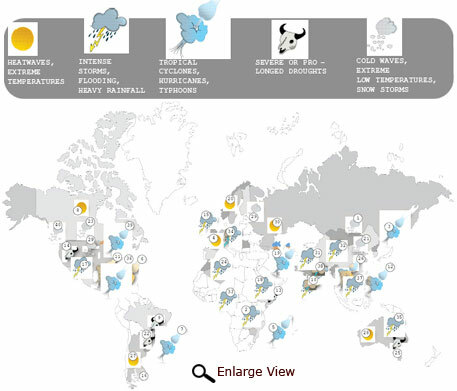 Projected precipitation and temperature changes imply changes in floods, although overall there is low confidence at the global scale regarding climate-driven changes in magnitude or frequency of river-related flooding, due to limited evidence and because the causes of regional changes are complex. Some influences are fairly robust, the panel says, particularly a warming of extreme daily maximum (and minimum) temperatures. But the report finds only “medium confidence” (a 50/50 chance) in a link between human activities and intensification of extreme rainfall on a global scale. (A big issue, of course, is the lack of long-term data outside developed countries.) And the odds go down from there on attributing other recent shifts in weather-related disasters to global warming. At least some of the weather extremes being seen around the world are consequences of human-induced climate change and can be expected to worsen in coming decades. It is likely that greenhouse gas emissions related to human activity have already led to more record-high temperatures and fewer record lows, as well as to greater coastal flooding and possibly to more extremes of precipitation, the report said. Whether inland flooding is getting worse because of greenhouse gases is murkier, the report said. Nor, it found, can any firm conclusion be drawn at this point about a human influence on hurricanes, typhoons, hail storms or tornadoes. Even as such extremes are projected to increase, human vulnerability to them is growing as well, the report said. Rising populations and flawed decisions about land use, like permitting unchecked coastal development, are putting more and more people in harm’s way, the report said. “Rapid urbanization and the growth of megacities, especially in the developing countries, have led to the emergence of highly vulnerable urban communities, particularly through informal settlements (slums) and inadequate land management,” the report said. Increases in population density and in the value of property at risk, rather than changes in the climate, are the likeliest explanation for rising disaster losses in many countries, the report said. It called on governments to do a better job of protecting people and heading off catastrophes before they strike. The summary contains a sobering message for those eager to point to current patterns of extreme weather as the manifestation of greenhouse-driven warming. Projected changes in climate extremes under different emissions scenarios generally do not strongly diverge in the coming two to three decades, but these signals are relatively small compared to natural climate variability over this time frame. Even the sign of projected changes in some climate extremes over this time frame is uncertain. The uncertainties in the historical tropical cyclone records, the incomplete understanding of the physical mechanisms linking tropical cyclone metrics to climate change, and the degree of tropical cyclone variability provide only low confidence for the attribution of any detectable changes in tropical cyclone activity to anthropogenic influences. While the summary warns of enormously increasing risks from drought and flooding in decades to come, it is bound to disappoint climate campaigners. The section on disaster losses correctly reflects the uncertainty injected in such analysis by confounding factors, including rapidly shifting human populations and the paucity of solid data over long periods. The report summary notes how wealth and development powerfully shield countries from human losses in disasters while amplifying the financial costs of such events. The section on managing risks is particularly valuable, describing strategies that have a host of benefits no matter which scenario for emissions and climate change plays out. Here’s one important point: Many measures, when implemented effectively, make sense under a range of future climates (medium evidence, high agreement). These “low regrets” measures include systems that warn people of impending disasters; changes in land use planning; sustainable land management; ecosystem management; improvements in health surveillance, water supplies, and drainage systems; development and enforcement of building codes; and better education and awareness. My observations: Weather and climate are highly location specific and thus as a result present different patterns with changing environment like ecological changes to meet the needs of ever increasing population pressure under new technological lifestyles. Over this superposed the natural variations created more confusion as our lifespan is short to understand the underlying physics. Let me give an example of All-India Southwest Monsoon Rainfall pattern. India has wealth of meteorological data, more particularly rainfall data (the above report states lack of data in developing countries, is false statement – I studied the data of several countries in developing countries). The precipitation data series of all-India Southwest Monsoon started in 1871. This data series present a cyclic pattern of 60-years following the Indian Astrological cycle. The data series showed two cycles completed and third cycle started in 1987 to end by 2046. A cycle is a Sine curve in which 30 years up and 30 years down the Mean. In the up part average is more than mean with more frequent wet spells – floods including river floods; in the down part average is less than mean with more frequent dry spells – droughts inclusive of fewer floods in rivers. When we study a part of such data series we may come up with increasing trend or decreasing trend based on the selected period in the cycles. Similarly the intensive rainfall spells increase or decrease. This flawed analysis. This was the case with report of INCCA submitted to MoEF – Krishna Kumar of IITM presentation to MoEF and MoEF interpretation of river floods and Minister’s report to parliament. The same is seen in IPCC summary report and thus they were cautious and put it 50:50 chances. Let the government start working on analyzing the full data series at local, regional and national level. Let IMD or IITM complete the data series left at 1994 to 2011 so that scientists can come up with better interpretations. In the case of temperature, it not only presents a trend but also superposed on it the cyclic pattern. The extremes reflect this pattern. Also, the temperature patterns all over the globe presented different patterns including India. The change is more in winter compared to summer. Why? Is it associated with urban heat island effect? It does not mean we should not help in reducing greenhouse gases. Instead depending upon fossil fuels, the government must look in to other direct and indirect factors contributing to global warming. The global temperature data series analysis presentan increasing trend and by 2100 it reaches by 1.13 degrees Celsius and over this superposed - 0.3 to +0.3 degrees Celsius 60-year cyclic pattern. Yes, this is very disturbing news. Where I live, we receive 740 mm in a year. I can get no one here interested is this. I have designed a RWH system here, but have not built it yet. Looks like I need to start! The local politicos prefer to be ignorant about this.. Though lot many signs of natural disasters arising from climate change are is evident, the required action is not being taken. Will boastful remarks made at climate change conventions serve any purpose save humanity? Isn't it the responsibility of each and every person to engage in genuine endeavours to tackle the problem of global warming? Though the Kyoto Protocol deadline about to expire, no consensus has been arrived at. Everybody is busy trying to get rid of their load of duties and burden others, claiming thay are responsible for global warming. Is it wise for the Annex 1 countries to spend large sums of money to carry out wars, research and development in arms and aircraft when they need to focus on climate change mitigation? Not only the developed world, even the developing countries do not seem to be serious about it, although it is evident that it these countries will be affected more severely. Merely producing data on paper for CDM projects will not help. It will be better if serious efforts are made by each one of us with measurable results. Our government should be more assertive and help the international community reach a consensus in the upcoming UNFCCC meet.